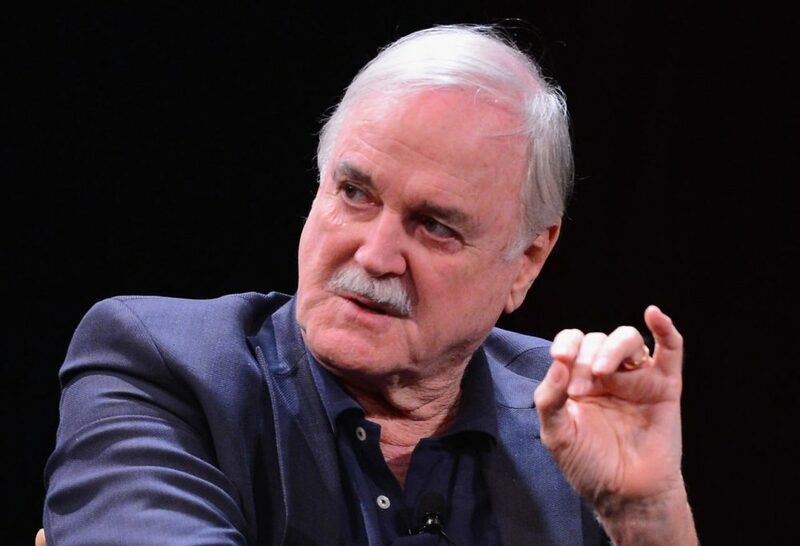 One of Here & Now host Robin Young's favorite interviews in recent years was with legendary British funnyman John Cleese of "Monty Python" and "A Fish Called Wanda" fame. Last year, they sat down at the John F. Kennedy Library in Boston to talk about Cleese's memoir "So, Anyway..." (excerpt below). Unfortunately, that conversation wasn't recorded, so with the book coming out in paperback, Robin takes the opportunity to catch up with John Cleese again. "I once performed to an audience of two at the Edinburg Festival. There were three of us doing this little review, late night review, and the producer said to us 'It's alright, you. We're not doing the 6 o’clock show. There's nobody here.' So we went down and had a drink and suddenly the guy ran in and said 'No, no. There's an audience.' And we ran upstairs and raced onto the stage singing and there were two people in the audience. We were outnumbering them." "We used to start the show by singing a song called (singing) 'It's the end of the show, it's time now to go. Well we hope we brought you laughter and joy. So until we meet you all again next year, it's goodbye, goodbye, goodbye.' And then somebody came out and said 'I'm afraid there's been a few changes in the running order,' which I thought was quite a good joke." A lot of fans wanted a "Monty Python" tell-all book. Why didn't you write that? "I'll tell you what, because I decided to write an autobiography, and as I said to people - probably a bit defensively - if I was going to write a book about 'Monty Python' it would actually be called 'Monty Python by John Cleese.' But if it's John Cleese's autobiography, then I'm afraid you're stuck with the fact that it's about me. And those of you who have no interest in me at all and only love 'Monty Python' should stay well away from the book." "Most of my time in therapy was spent really due to my mum who had many good qualities like punctilious housekeeping, good cooking and all that kind of thing. But she was not as they say 'emotionally available.' And in fact, the warmth and affection in me, in my life, came from my dad who was much more affectionate physically than you would think of someone, you know, who was born in 1893. But mum was always like an unexploded bomb. You never knew what was going to set her off." "Yeah, I was six foot when I was 12. When I first went - because I was an only child of older parents, I lived a fairly quiet life. And we were always moving house, Robin. Once a year we'd move house so I hadn't many close friends. So when I went to school I just didn't fit in very well. I didn't really know how to be a school boy. So they gave me a slightly rough time, which was kind of funny when I was being bullied by people literally half my size. But I discovered if I made them laugh, there's immediately an acceptance and a warmth." Do you ever get tired of your old skits? "No. When we were doing The O2 show in London, this huge arena – 16,000 people – Michael and I had fun every single night. Because we knew that everybody knew what the lines really were, so we didn’t have to do it right. So we were able to adlib and we then segued into the cheese sketch for no reason at all. We started making up cheeses that didn’t exist like rhinoceros milk cheese and all this kind of thing. And then we would spend most of the last two minutes laughing and trying to break each other out and the audience just loved it because they'd seen it done properly and it was much more fun when we did it in some silly strange way we'd never do it again." I made my first public appearance on the stairs up to the school nurse’s room, at St. Peter’s Preparatory School, Weston-super-Mare, Somerset, England, on September 13, 1948. I was eight and five-sixths. My audience was a pack of nine-year-olds, who were jeering at me and baying, “Chee-eese! Chee-eese!” I kept climbing the steps, despite the feelings of humiliation and fear. But above all, I was bewildered. How had I managed to attract so much attention? What had I done to provoke this aggression? And . . . how on earth did they know that my family surname had once been Cheese? As Matron “Fishy” Findlater gave me the customary new-boy physical examination, I tried to gather my thoughts. My parents had always warned me to keep away from “nasty rough boys.” What, then, were they doing at a nice school like St. Peter’s? And how was I supposed to avoid them? In addition, as a result of my excessive height, I had “outgrown my strength,” and my physical weakness meant that I was uncoordinated and awkward; so much so that a few years later my PE teacher, Captain Lancaster, was to describe me as “six foot of chewed string.” Add to that the fact that I had had no previous experience of the feral nature of gangs of young boys, and you will understand why my face bore the expression of an authentic coward as “Fishy” opened the door and coaxed me out towards my second public appearance. Faces were thrust at me, each one of them demanding, “Round­head or Cavalier?” What were they talking about? Of course, I’m not sure it is my first memory; I’m sure I used to think it was; and I like to think it was, too, because it would make sense, baby me lying in a pram, contentedly watching the interplay of the glinting verdant foliage and its beautiful hues. On August 14, 1940, German planes bombed Weston-super-Mare. This is verifiable: it was in all the papers. Especially the Weston Mer­cury. Most Westonians were confident the raid had been a mistake. The Germans were a people famous for their efficiency, so why would they drop perfectly good bombs on Weston-super-Mare, when there was nothing in Weston that a bomb could destroy that could possibly be as valuable as the bomb that destroyed it? That would mean that every explosion would make a tiny dent in the German economy. The Germans did return, however, and several times, which mys­tified everyone. Nevertheless I can’t help thinking that Westonians actually quite liked being bombed: it gave them a sense of signifi­cance that was otherwise lacking from their lives. But that still leaves the question why would the Hun have bothered? Was it just Teutonic joie de vivre? Did the Luftwaffe pilots mistake the Weston seafront for the Western Front? I have heard it quite seriously put forward by older Westonians that it was done at the behest of William Joyce, the infamous “Lord Haw-Haw,” who was hanged as a traitor in 1944 by the British for making Nazi propaganda radio broadcasts to Britain during the war. When I asked these amateur historians why a man of Irish descent who was born in Brooklyn would have such an animus against Weston that he would buttonhole Hitler on the matter, they fell silent. I prefer to believe that it was because of a grudge held by Reichsmarschall Hermann Goering on account of an unsavoury in­cident on Weston pier in the 1920s, probably involving Noël Coward and Terence Rattigan. My father’s explanation, however, makes the most sense: he said the Germans bombed Weston to show that they really do have a sense of humour. Whatever the truth of the matter, two days after that first raid we had moved to a quaint little Somerset village called Brent Knoll. Dad had had quite enough of big bangs during his four years in the trenches in France, and since he was up to nothing in Weston that was vital to the war effort, he spent the day after the bombing driv­ing around the countryside near Weston until he found a small farm­house, owned by a Mr. and Mrs. Raffle, who agreed to take the Cleese family on as paying guests. I love the fact that he didn’t mess around. We were out of there! And it was typically smart of him to find a farm, where, at a time of strict rationing, an egg or a chicken or even a small pig could go missing without attracting too much attention. Back to the tree. I revisited the farm many years later, and, just as I thought I remembered, there was a huge chestnut tree in the middle of the front lawn, under which I might easily have lain in a pram. In 1940 the farmhouse had been one of a row of houses of me­dium size strung along a road, with fields opposite; it didn’t look very farm-like from the front, but when you walked up the drive and got to the back of the house you saw there was a proper farmyard, with mud and chickens and rusty farm equipment and ferrets in cages and rabbits in wooden hutches. And it was this location that provides my second memory. (It must come after the first because in it I am now standing up.) I was bitten by a rabbit. Or rather, I was nibbled by a rabbit, but, because I was such a weedy, namby-pamby little pansy, I reacted as though I’d lost a limb. It was the sheer unfairness of it all that so upset me. One minute, I was saying, “Hello, Mr. Bunny!” and smiling at its sweet little face and funny floppy ears. The next, the fucker savaged me. It seemed so gratuitous. What, I asked myself, had I done to the rabbit to deserve this psychotic response? I hesitate to criticise Dad, because what sanity I have I owe to his loving kindness. But there’s no doubt that he did pamper me, and such early coddling was one of the reasons I embarked on a wussy lifestyle. Throughout my schoolboy days I never felt very manly, or strong, or virile, or vigorous, or healthily aggressive. At school I avoided playground “gangs,” because I didn’t understand why anyone would want to behave like that. I loved ball games, but was always appalled at how rough, for example, rugby looked, even at the safe distance I kept while pretending to play it. When I was seventeen, my assistant Clifton College housemaster, Alec MacDonald, finally took me to task for funking tackles. Describing my efforts as “danc­ing around like a disabled fairy,” he ordered me to watch while he gave a demonstration of how to tackle properly. He asked a member of the first XV, Tony Rogers, to run at him. He closed in on Rogers, and then went in hard, just as Rogers tried to sidestep him. The result was that the top of Mr. MacDonald’s head came into sharp contact with Rogers’ right hip. Mr. MacDonald was unavailable for teaching later that afternoon; indeed he did not reappear for forty-eight hours. When he did, I was too cowardly to remind him that he had specifi­cally told me that “if you go in hard, you never get hurt.” So when I see international rugby teams lumbering out at Twickenham, I look at them with awe, but also with a sense of being genetically discon­nected from them. I was not born to be butch, and I have accepted my innate unmanliness without complaint. Besides, it seems to me that cowards very seldom cause trouble, which is probably why there is a history of them being shot by people who do. None of this, incidentally, is to say that my infant wussiness was in any way admirable. But while I was undeniably a gutless little weed there was an upside: at least I didn’t display the habitual mind­less aggression of some young males. Better a wuss than a psycho, I say, and I am proud that I have never been able to force myself to watch cage fighting. If part of my weedy outlook on life came from my father’s pam­pering, a fair proportion was down to my complicated relationship with my mother. And in this context another early memory comes to mind. I am lying in bed, falling asleep, when a noise causes me to turn and see shadows moving on the half-open door of my bedroom. They are shadows of my parents fighting. Dad has been coming into my room and Mum has started attacking him, pummelling him with a flurry of blows which he is trying to fend off. There is no sound—I sense they are both trying not to wake me—and the memory has no emotion attached, although it is very clear. Just the shadows which last a few seconds and then . . . silence. As I write this, my throat tightens a little. The level of violence I’m describing is low: there are no shillelaghs or chainsaws here, just lower-middle-class fisticuffs, with no prospect of Grievous Bodily Harm, as English law calls it. Nevertheless, my beloved dad, a kind and decent person, is being at­tacked by this unknowable creature who is widely rumoured to be my mother. Please do not think that I am loftily labeling her a “bad mother.” In many ways she was a good mother; sometimes a very good mother. In all day-to-day matters she was extremely diligent: preparing good meals, making sure I was properly clothed and shod and warm and dry, keeping the house neat and clean, and fiercely protective of me. Under light hypnosis, I once recalled a German air raid, with the sound of the bombers not far away, and Mother throwing herself on top of me, under a big kitchen table. If it was a false memory, it’s still what she would have done. From a practical point of view, then, she was impeccable. But she was also self-obsessed and anxious, and that could make life with her very uncomfortable indeed. A clue to her self-obsession, I always felt, was her extraordinary lack of general knowledge. On one of her visits to London in the late ’80s, a salad was prepared for lunch which contained quails’ eggs. She asked what kind of eggs they were and I explained that they were moles’ eggs, and that when we wanted them, we would go up to Hampstead Heath very early in the morning, as moles laid them at the entrance to their burrows during the night, collect the eggs and make sure we ate them the same day before they had time to hatch. She listened with great attention, as my family’s jaws sagged, and said she thought them “delicious.” Later that day she caught a men­tion of Mary, Queen of Scots. She recognised the name and asked me who this was. With my family listening, I pushed the envelope a little, telling her that Mary was a champion Glaswegian darts player who had been killed in the Blitz. “What a shame,” she said. I was being a bit naughty, of course, but I also wanted to prove to my family the truth of a comment I had made earlier about Mother, which they had not accepted on first hearing. I had told them that she had no information about anything that was not going to affect her life directly in the immediate future; and that consequently she possessed no general knowledge—and when I said no general knowledge, I didn’t mean very, very little. Naturally they had thought I was exaggerating. And the reason for this was not that she was unintelligent, but that she lived her life in such a constant state of high anxiety, border­ing on incipient panic, that she could focus only on the things that might directly affect her. So it goes without saying that she suffered from all the usual phobias, along with a few special ones (like albinos and people wearing eye patches). But she also cast her net wider. In fact, I used to joke that she suffered from omniphobia—you name it, she had a morbid dread of it. It’s true that I never saw her alarmed by a loaf of bread or a cardigan or even a chair, but anything above me­dium size that could move around a bit was a hazard, and any reason­ably loud sound startled her beyond reason. I once compiled a list of events that frightened her, and it was quite comprehensive: very loud snoring; low-flying aircraft; church bells; fire engines; trains; buses and lorries; thunder; shouting; large cars; most medium-sized cars; noisy small cars; burglar alarms; fireworks, especially crackers; loud radios; barking dogs; whinnying horses; nearby silent horses; cows in general; megaphones; sheep; corks coming out of sparkling wine bottles; motorcycles, even very small ones; balloons being popped; vacuum cleaners (not being used by her); things being dropped; din­ner gongs; parrot houses; whoopee cushions; chiming doorbells; hammering; bombs; hooters; old-fashioned alarm clocks; pneumatic drills; and hairdryers (even those used by her). In a nutshell, Mother experienced the cosmos as a vast, limitless booby trap. Consequently, it was never possible for her really to relax, except perhaps for the times when she sat on the sofa knitting while Dad and I watched television. But even then she was active, knitting away against time. I noticed years ago that when people (myself definitely included) are anxious they tend to busy themselves with irrelevant activities, because these distract from and therefore reduce their ac­tual experience of anxiety. To stay perfectly still is to feel the fear at its maximum intensity, so instead you scuttle around doing things as though you are, in some mysterious way, short of time. But although Mother kept herself busy in countless and pointless ways, it did not alleviate her worrying: her pervading sense that she was keeping nameless disasters at bay only by incessantly anticipating them, and that one moment’s lapse in this vigilance would bring them hurtling towards her. I once proposed to Dad that we should purchase a large hamster wheel for her, so that she would find it easy to remain active all day, instead of having continually to invent non-essential activi­ties like polishing cans of peas, or stacking cups, or sewing borders on handkerchiefs, or boiling knitting needles, or weeding the carpet. Her own approach was to write her worries down on a piece of paper, so that there was no chance she would forget one, thus un­leashing it. After Dad died, I would drive down to Weston to visit her and she would greet me with a cup of coffee and a very long list of worries which she had been compiling during the previous weeks, and we would sit down and discuss each worry in turn at some length: what it was about, and why it mattered, and how likely it was to happen, and what she could do to forestall it, and what we could do if it did actually happen, and whether we would know what to do if it didn’t . . . and after we’d processed six or so, she’d make me another cup of coffee and we would continue working till bedtime. And if we hadn’t got through them all by then, we’d leave the rest for breakfast. It took me decades to realise that it was not the analysing of her worries that eased them; it was the continuous contact with another person that gradually calmed her. Why Mother should have been quite so anxious I simply don’t know, but the net effect was to make her difficult. Actually, “dif­ficult” is not quite fair. There was only one thing that she wanted. Just one. But that one thing was her own way. And if she didn’t get it, that upset her. And she was prettily easily upset; in fact I think it’s fair to say she had a real facility for it; and when something did upset her—and there was a very limited supply of things that, in the final analysis, didn’t—she would throw a tantrum, or several tantra, of such inconceivable volume and activity that there must have been times when Dad yearned for the relative tranquillity of the trenches in France. But Mother would never have seen herself as a tyrant: her trick was to rule through weakness. Whereas Dad might prefer to sleep with a window open, Mother had to have it shut, because she just couldn’t cope with the alternative. Sadly, there was no choice, so nego­tiation was never an option, although Dad once confided to me that she had been much more flexible before they’d got married. It was only in later years that I began to see just how alarmed Dad really was by the tantrums. While he talked occasionally about the need “to keep the little woman on an even keel,” his faux-amused casualness was intended to conceal his fear, for when Mother lost her temper, she really lost it: her rage filled her skin until there was no room left for the rest of her personality, which had to move over till things calmed down a bit. The phrase “beside oneself with anger” could have been coined in Weston-super-Mare. Mother could be quite charming and bright and amusing, but that was when we had visitors. Once they had gone, her sociability began to fade. This meant that there was nearly always tension in the Cleese household because when mother was not actually angry it was only because she was not angry yet. Dad and I knew that the slightest thing—almost anything—would set her off, so constant pla­catory behaviour was the name of the game. JOHN CLEESE: I’m afraid I’m not very good company tonight. CONNIE BOOTH: No, it’s me. I’m on edge. JC: No, no, no, you are marvellous, really super! It’s me. CB: Look, let’s forget it. JC: I’m not good company. JC: I’m not. I’ve been fussing you. JC: I have been fussing you. It’s my own fault, you told me last time about fussing you too much. JC: Look, am I fussing you too much? “Oh God, I’ve gone too far,” I thought. And then she cackled with laughter. I don’t think I ever loved her as much as I did at that moment. The most perceptive definition of a coward is Ambrose Bierce’s: “One who in a perilous emergency thinks with his legs.” This trait seems to me such a wise response to danger that it explains why generals want cowards dead; if they weren’t, the concept of just plain running away would catch on so fast that the top brass would be out of a job overnight—or at least, would have to do some fighting themselves, which is not part of their job description. Excerpted from So, Anyway… by John Cleese. Copyright © 2014 by John Cleese. Excerpted by permission of Crown Archetype, a division of Penguin Random House, Inc. All rights reserved. No part of this excerpt may be reproduced or reprinted without permission in writing from the publisher. John Cleese, English actor, comedian, writer and film producer. He tweets @JohnCleese. This segment aired on September 29, 2015.